There were earlier rumors of Goligoski possibly not playing, but they were put to rest as Gogo was present during warm ups. Goligoksi’s reason for not practicing Friday was illness not injury. The Pens started the game with an early Sidney Crosby penalty, 2 minutes for hooking after the Refs miss an obvious penalty on the Sharks a minute earlier. The PK Unit was doing fairly well, as Staal got a good shorthanded chance. 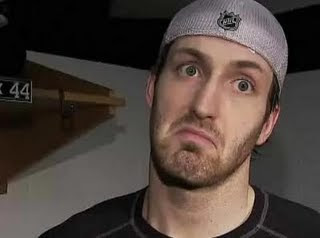 Though the Pens were looking decent, McGinn sneaks one by Fleury by taking a shot that bounces of Fleury’s pads [0-1]. Nichol and Ortmeyer assisted. Sharks got some good chances on net before Craig Adams heads to the box at 6:23 for hooking. The PK Unit of Staal and Cooke looked much better than there first attempt. The Pens continued to struggled to get into the offensive zone, they get a slight break as Clowe goes 2 minutes for tripping at 8:51 The first PP unit gets some good chances but no dice. Letang goes down hard after being tripped while taking a shot, no call. Pens 0-1 on the powerplay. Fleury with a decent glove save on Heatly and then makes a outstanding save on the doorstep on Thornton. Cookie takes a little run, gets called for roughing, Doesn't take long before Pavelski re-directs a shot behind Flower, [0-2]. PPG Dan Boyle and Malhotra credited the assists Mike Rupp trys to stir things up and drops the gloves with Staubitz, Machine with the win, but the Pens continued to struggle. Fleury makes another unbelievable save on Joe Thornton with 2:35 left in the first Crosby gets a great chance, but the puck bounces off his stick from Kunitz pass, Nabokov with the easy save to virtually end the first period. Pens were out shot 13-3 in the first Letang did not return after going hard to the ice Pens are playing as if they are stuck in the third period of the Sharks game, they resorted back to the “dump and go” which was not working for them. No execution whatsoever. FSN continued to remind us that we are hurting without Geno and Sarge, um duh? Billy and Sid take turns with some good chances on Nabokov no dice. Decent shift for the 1st line. Cookie goes to the sin bin for diving and Pavelski goes for hooking 4-on-4 Dan Boyle fakes Skoula out; [0-3] goal came on a 4-4 Ortmeyer and Huskins with the assists HCDB pulls Fleury, Johnson in. Pens again cannot get the puck out of their own zone. Dany Heatly scores a garbage goal off the rebound, no one picked up Pavelski coming out of the box who took the original shot [0-4] Pavelski and Thornton with the assists. We have to say it, Bill Guerin is officially snake bitten. Craig Adams goes to the box for tripping, Pavelski goes to the box 4 on 4 on an interference call. Jordan Staal gets a decent chance out skating Dan Boyle but misses the net. Pens go on the short PP coming off the 4-on-4, not very eventful. Kunitz gets 2 great chances on the PP, Nabakov with better saves Godard and Clowe go to the penalty box for a tussle in front of Nabakov 2nd period over. Pens were out shot 21-15 at the end of the second period. Letang did not return, could be more bad news to the Pens. Pens open the third with a face off win! Jordan Staal just being a beast on the ice trying to get something going for the Pens. Bob Errey quotes him as being a “powerful horse”. Brent Johnson does a good job of keeping the puck out of the back of the net on a couple of chances by the Sharks. Crosby unit gets a good shift in against the Thornton unit. Cookie blasts Satubitz into the boards and then comes back to hit Murray. Jay McKee takes a penalty and then goes after Jody Shelley. McKee gets the worst of it. McKee leaves the game after receiving 2 for instigating, 2 for roughing, 5 for fighting and 10 for misconduct. Pens are now down to 4 defensemen. 4 minute powerplay for the Sharks Malhotra rips one through traffic passed Johnson [0-5] PPG Vlasic and Clowe with the assist Heatly goes to the box for slashing, but it's not even worth mentioning because the PP did nothing. Staal with a great one timer no one there for the rebound, a re-occurring event for the Pens as of late. Godard throws down the gloves with Jody Shelley trying to get the boys going; it was a pretty even fight between the two heavy weights. Sid gets a great chance to get the Pens on the board, no dice. One last rush for the Pens with about 15 seconds left but Nabokov closes the door on any chance.
.: Game 0-5 Sharks :. Yes that's how we feel too Brooksie. Mike Rupp makes an appearance on the Sesame Street line. Pens seemed to be set on passing the puck when there is a decent scoring chance. First time DB has gone 2 games without getting a point. Penguins: It runs down hill. Want a chance to win Penguins/Flyers tickets? Check out how.